Ten days ago I finished my last big piece of writing for Planet Mercenary. Yesterday Sandra and I finished the last small piece. Today we reviewed the cover layout, and realized it’s ready to be sent to the printer. This has taken much longer than I wanted it to, but the project looks much, much better than I believed it could. Part of the delay is due to repeated discoveries that we could be doing something better, and then deciding to do it better. And of course another part of the delay is us not knowing how to work as quickly as we originally thought we could. If you backed the project, your book (and anything else that ships with it) will be shipped July. If you didn’t back the project you can still use Backerkit to place a pre-order, but that link will go away in a few weeks. 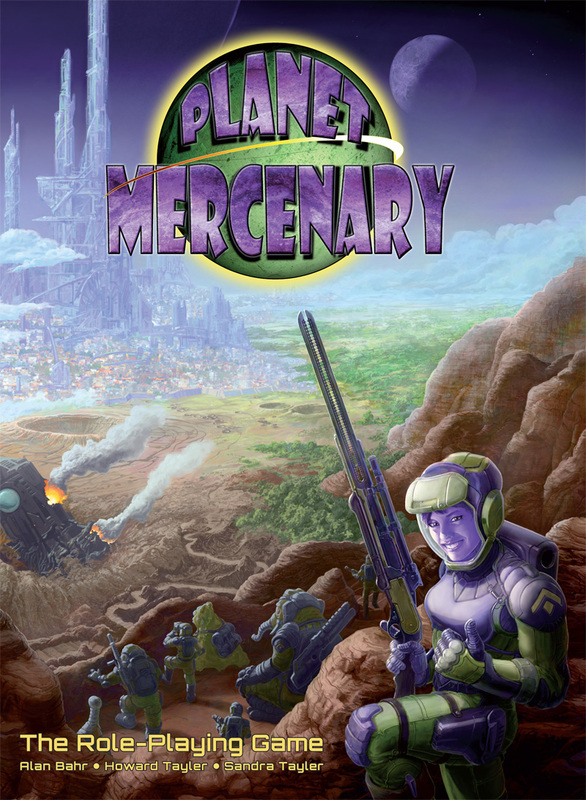 Eventually we’ll have Planet Mercenary in the Schlock Mercenary Store, but that’s not going to happen before July. I need to write a whole different post talking about how awesome Sandra and Alan are, and how grateful I am that they figured out how to work with, and around me. For now I’ll just say that in terms of actual work done, Sandra’s name is listed at least one position too far to the right. Note: The cover art above is by Jeff Zugale, and was laid out (along with the rest of the pages in the book) by Mike Brodu under Sandra Tayler‘s direction. The fact that the logo I designed two years ago is still a part of all this is evidence more of the force of my personality than my skill at logo design. 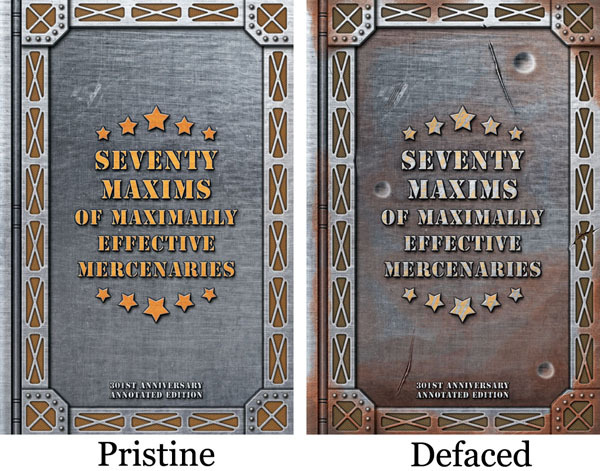 Seventy Maxims of Maximally Effective Mercenaries is now available. At this time, the book is only available from the Planet Mercenary backerkit page. 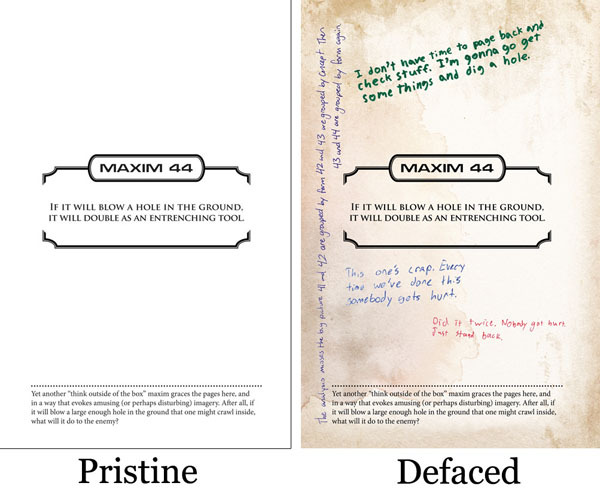 The Planet Mercenary RPG is not yet shipping, so if you want your Seventy Maxims book to ship immediately, make sure it’s the only thing you put in your cart. 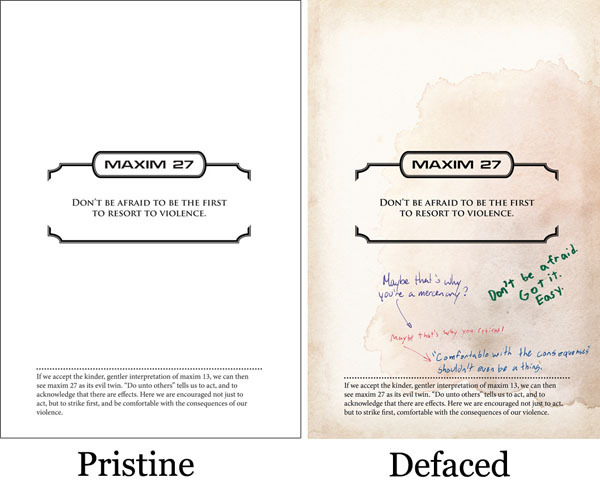 There are two editions, which we’re calling “Pristine” and “Defaced.” They are both in-universe artifacts: the pristine version is one of the thousands of copies of the Seventy Maxims book that the average connoisseur of 31st century printed collectibles might find themselves fortunate enough to acquire; the defaced version is the copy that CDS Sergeant Edwards¹ handed to Private Karl Tagon on March 1st, 3035. Karl’s book has some mileage on it. 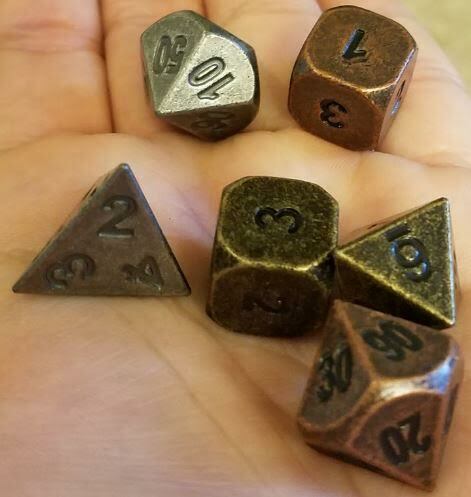 He made notes on the pages, and on January 28th, 3093, handed it off to his son, Captain Kaff Tagon, who had it for six years, making his own notes. 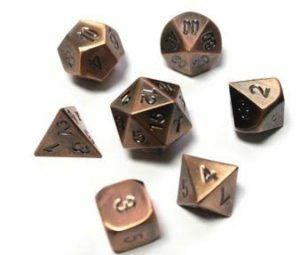 He gifted it to Captain Alexia Murtaugh in 3099, and she added her notes. When Murtaugh was injured in early 3100 Sergeant Schlock went through her stuff, and borrowed the book. He found a felt-tip pen, too, and treated the existing notes as permission to deploy it. The pages of the two books look quite a bit different. Both books have scholarly² commentary at the bottom of each maxim’s page, and and the scholars do not always agree with the sentiment of the source material. This book took a lot more work than we thought it would, but based on the response from people who’ve already gotten their copies, all that work was worth it. ¹ Sergeant Edwards, later Banneret Commodore Edwards of the Continuance Fleet, does not appear in the comic strip anywhere. Maybe someday I’ll tell his full story. ² The scholars in question are all me. I had far too much fun critically pontificating on my own writing.